CANTON, Mass. (September 3, 2013) – With Labor Day behind us, Dunkin’ Donuts fans can now look forward to one of the brand’s most anticipated times of the year: the return of pumpkin beverages and bakery items. Today, Dunkin’ Donuts, America’s all-day, everyday stop for coffee and baked goods, welcomes September by introducing new pumpkin menu items, including a new Pumpkin Pie Donut, and a new Frozen Pumpkin Coffee Coolatta®, and bringing back several popular pumpkin selections, including pumpkin coffees, lattes, donuts, muffins and more. 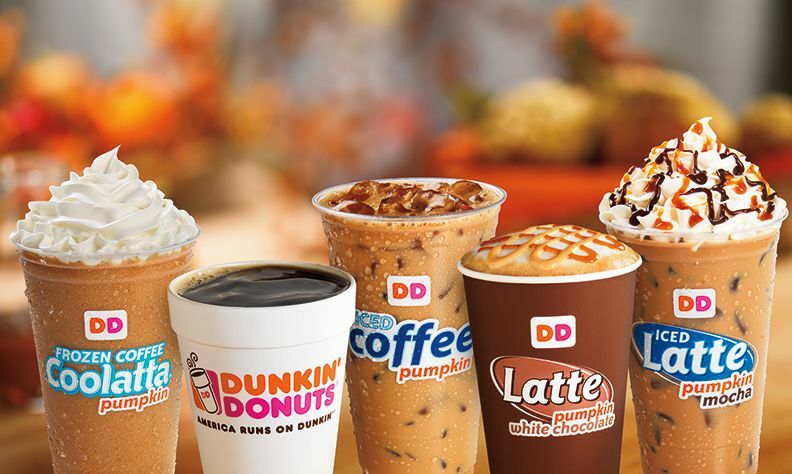 Dunkin’ Donuts offers guests one of the largest varieties of pumpkin food and beverages of any national restaurant chain. Pumpkin K-Cup® packs: This variety of the brand’s popular K-Cup packs, for use with the Keurig® K-Cup® Brewing Systems, allows people to enjoy the taste of Dunkin’ Donuts’ Pumpkin Flavored Coffee in individually-sized portions at home. Pumpkin Donut and MUNCHKINS®: Guests can savor the season with the glazed pumpkin cake donut, which can also be enjoyed as a MUNCHKIN donut hole treat.